A week or so ago I shared what Big Brother will be learning over the summer and I mentioned that we would Read, Read, Read!! Well, with the help of many awesome book lists I've pinned on my Language Arts boards, I have gathered a summer reading list for my soon to be 6 year old son. 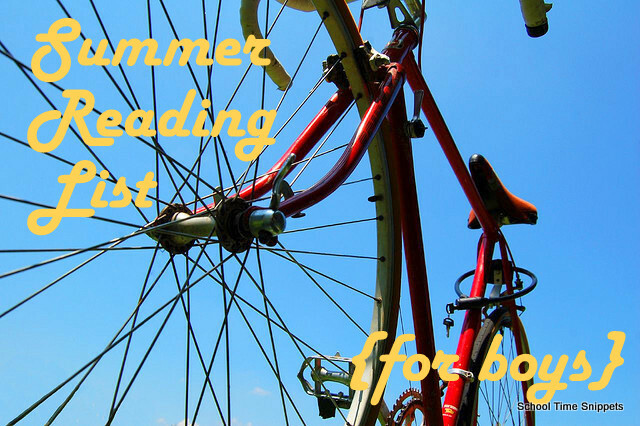 And I am sharing this list with you as part of the TOS Blog Cruise~ Summer Reading List for Boys. Our lists includes picture books, early readers, and chapter books! I think it is safe to say we are going to have a WONDERFUL time reading!! We have some of these books sitting on our bookshelf, but many of these we will check out at the library. I am linking to Amazon (see my disclosure) so that you can view them yourself. I always like being able to see a picture of the book! Story of the World Volume 1 by Susan Wise Bauer. I initially purchased this to be used as a Read Aloud for the Fall, but why sit on the book for that long? Pretty lofty list!! But I figure they will be read when a break is needed from the hot sun and/or at lunch time, bedtime, and whenever else I feel like it's a good time to read! Are there anymore you would recommend??? What will you and your kiddos be reading this summer?